The one Byrd is using is a full-size Brandis vernier quintant with an arc of 180 mm radius reading to 30 seconds, whereas my example is unusually small for a vernier quintant, having an arc radius of only 140 mm, also reading to 30 seconds, so my hopes of possessing an historic instrument were disappointed (but see postscript). Nevertheless, it is a rare and early instrument dating from about 1920 and I felt it was worthwhile to restore it to working order. As I have no access to original instruments, I did not set out to make exact copies of the attachments that make a nautical quintant into an aeronautical one, but I did follow the same principles, while retaining all the original parts. Needless to say, I dismantled it completely to begin with, and cleaned all the individual parts. A photograph of the restored instrument will perhaps best help to explain its workings. The optical path for the heavenly body is as usual, via the index mirror and silvered half of the horizon mirror. An ordinary spirit level vial is held in a carrier and viewed via an auxiliary mirror set at 45 degrees above it, through the plain half of the horizon mirror. The image of the bubble would be out of focus viewed directly through the x 2 Galilean telescope and so an extra, semicircular, lens is interposed in the light path to bring it into sharp focus. The auxiliary mirror may be swung downwards to allow direct view of the natural horizon by pressing a spring-loaded catch. The sensitivity of the vial has to be carefully chosen. If too sensitive, it is never at rest when the instrument is held in the hand and if not sensitive enough it is not possible to get meaningful results. I settled for one where the bubble moves 2 mm for 6 minutes change in level. This is of the same order of sensitivity as most other bubble sextants. 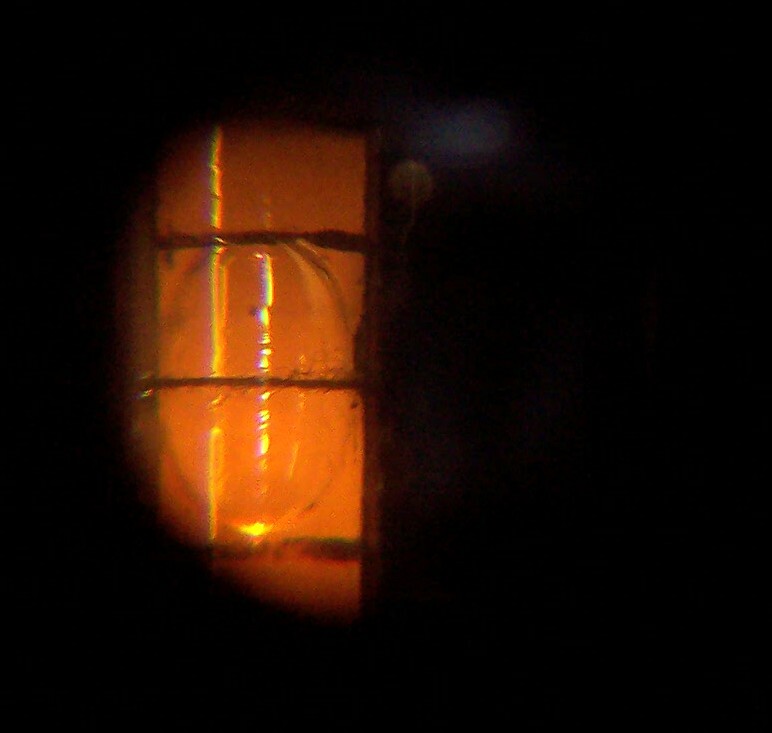 The bubble is illuminated from one end and, to try to get even illumination, the vial is painted white over most of its surface, including the end distant from the lamp. This has parallels in the lighting of some circular bubble cells, where an attempt is often made to conduct the light around the periphery of the cell with some sort of light guide. The next photograph shows a view of the lighted vial through the telescope (the view is somewhat more extensive than this in reality). 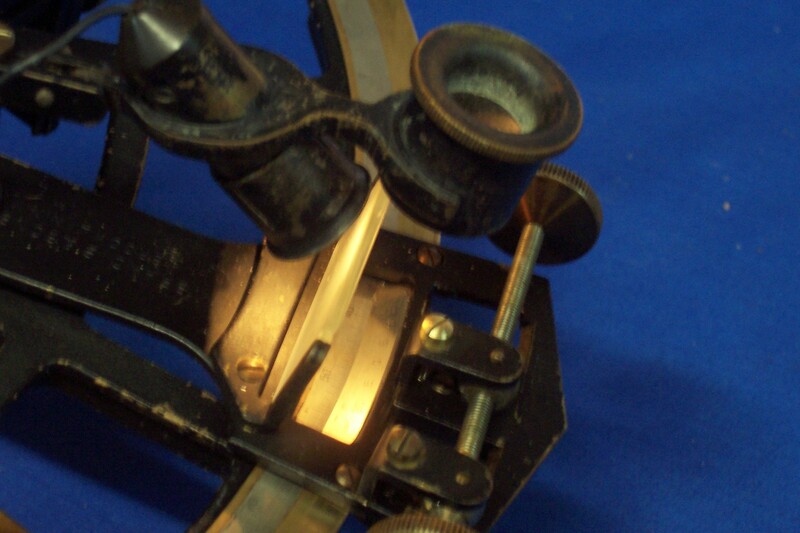 In sextants with circular bubble cells, one usually aims either to centre the body in the bubble or to align it with its equator, but this cannot be done with a linear cell, so a more-or-less central datum line is used and the sextant adjusted so that when the bubble is centred, the datum line lies on the horizontal. 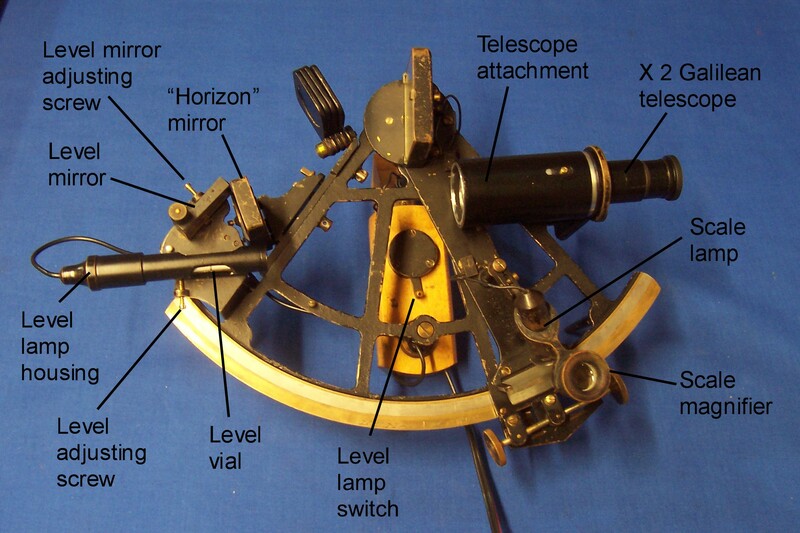 As is usual for a Galilean telescope, each half of the objective lens “sees” its own half of the field of view (compare this with the inverting or astronomical telescope, where obscuring half the objective simply cuts out half the total light). 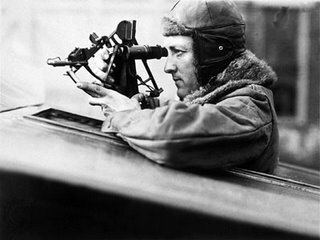 Thus, the auxiliary, semicircular lens in the telescope attachment sees the left half-field and is used to bring the bubble into focus by sliding back or forth. The heavenly body is seen on the other half-field and, as is usual, there is a narrow band of overlap where both the sky and the horizon or bubble may be seen together. I have not made any significant trials as yet, but it is relatively easy on dry land to align a star, the moon or the sun with the datum line while trying to keep the bubble centred. However, the instrument gives no indication of lateral tilt and in an aircraft the results must have been very uncertain. The scale lighting is particularly good. A shaded lamp shines via a standard diffusing screen on to the scales, which are viewed through a simple magnifier. Unlike many such systems it gives a very even illumination so that the main and vernier scales are seen with equal contrast, making reading relatively easy and rapid. The handle seems to be a modified early Brandis battery handle. Power is now from an external source. 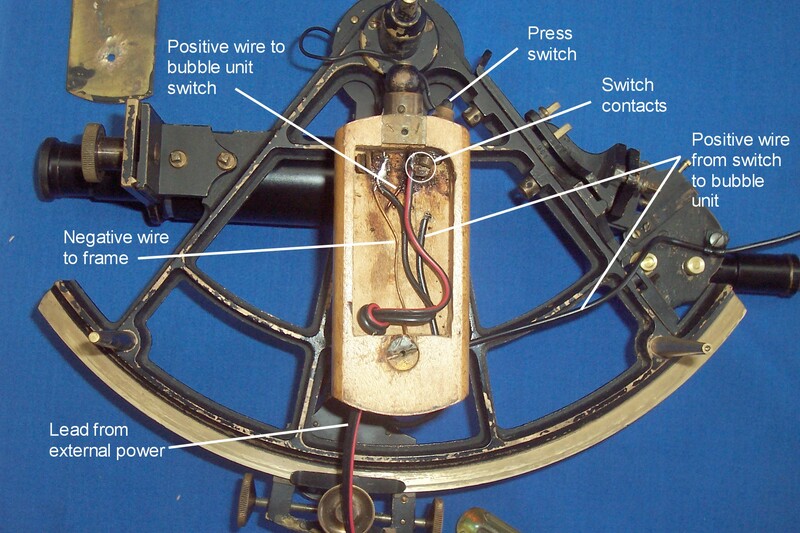 Scale lighting is via the original press switch, while the bubble unit is switched by a rather crude rotary switch on the front of the handle, seen in the general arrangement photo above. The following photo shows the wiring layout, pretty well as found except for the decayed silk covered wire. I have coated the parts that I have made – telescope and attachment, and vial carrier – with modern paint. The original paintwork on the rest of the instrument is careworn and I cannot help but feel that it would look better for a fresh coat of paint. I would repaint a more modern instrument in the same condition and wonder how readers might feel about that. Is it sufficiently “historic” to preserve it as found? Would repainting it devalue it in some way.”? After all, noone is likely to mistake it for a modern fake, repainted or not. The index shades, by the way, I borrowed from another Brandis sextant, so that if anyone has a spare set of Brandis or US Navy Mark II index shades that I can beg or buy, I should be glad to hear from them. Post script, 11 September 2015. 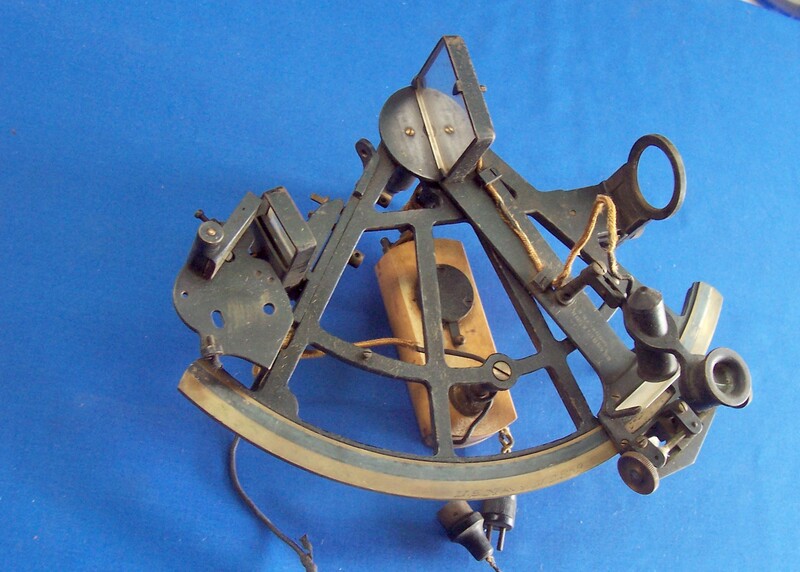 When I wrote this post, I thought Byrd was holding a larger sextant than mine, but an enquiry led me to look more closely at the structure of the sextant he is shown holding and I now believe that he is holding the same type of sextant that I describe, viz.a survey sextant of 140 mm radius.